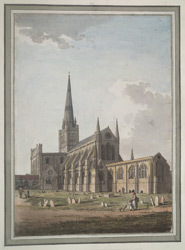 A south-east watercolour view of Chichester Cathedral in (West) Sussex, drawn in 1782 by S.H. Grimm. The cathedral was founded on the order of Bishop Ralph de Luffa around AD1080, on the site of a Saxon-era church. It had to be rebuilt after a great fire in 1187, and was renovated and extended periodically over later centuries, with the particular additions of the bell tower (between 1375 and 1430) and the 15th-century spire. Despite its late-medieval embellishments, the fundamentals of the Romanesque cathedral remain. Daniel Defoe visited here in the early 18th century, commenting: "the cathedral here is not the finest in England, but is far from being the most ordinary: The spire is a piece of excellent workmanship."